It's not surprise that Koh Lipe is one of the most popular islands in the Andaman Sea, if not the whole of Thailand. Dressed in paradise, this sublime island has become a firm favourite with travellers looking for some welcome downtime. Koh Lipe Island Thailand - where you will find the tranquility, calm and relaxation of the Andaman Sea. Koh Lipe, a small island in the Andaman Sea, is a little gem 60 km off the coast inside the Tarutao National Marine Park. Koh Lipe has become the southern anchor of the busy north-south Andaman tourist route and getting there these days couldn’t be easier with boats arriving from all up and down the coast including Koh Phi Phi, Koh Lanta, Krabi and Trang. Koh Lipe is also the jumping off point to Langkawi and Malaysia. At its largest the island is only 2 km long and 1 km wide. With 2 main beaches each with their own distinct character, there is something for everyone. The busy one, Pattaya beach has a wide beach stretched in a long crescent of fine white sand. In the evening it transforms as restaurants and bars set out chairs and bamboo mats on the sand and lit by candle lit, reggae tunes drift down the beach. On the other side of the island is Sunrise Beach with views of several small nearby islands and a cool onshore breeze most of the year. Sunrise Beach is the opposite of Pattaya beach, with just a few resorts and bars, it is very laid back. It also has a very large coral reef with the best snorkelling on the island directly from the beach. There are no cars on the island, and thankfully few motorbikes so people get around by walking. The whole island can be explored on foot in a couple of hours. Pooh’s Bar in the middle of the island is run by the charismatic Pooh and is almost an institution on the island. Famous for its live music in the evenings it draws a large crowd. Dragonheart at the north end of Sunrise Beach is well known on the back packer scene with its mellow music and great location. At the other end of Sunrise beach is Castaway Resort. Castaway Resort has stunning sea and island views which viewed from its raised candle lit deck has to be the ultimate in chilled out dining and drinking. Tarutao National Marine Park has some of the best dive sites in all of Thailand. Within easy boat reach of Koh Lipe are hundreds of coral reefs with an amazing variety of huge hard and soft corals. The corals and seas around Koh Lipe are full of marine life, offering everything from turtles to huge rays. Even if you aren’t a diver you can enjoy the marine world drifting along the edges of coral reefs with a mask and snorkel. Compared to other dive and snorkel areas there is so much to see and no competition to see it. Today, Koh Lipe attracts travellers from across the globe to enjoy some of the world's best beaches, and excellent snorkelling. The island is easily circumnavigated by foot in less than an hour, so if you fancy a change of scene, you can hotfoot it between Koh Lipe's favourite beaches, and fuel your stay in any of the island's great restaurants. Visitors are spoiled for choice for accommodation on Koh Lipe, with a great collection of upmarket and budget hotels and bungalows. It's an island rich in culture, and ripe with beauty. Koh Lipe still has a lot of cheap backpackers accommodation, with places like Varin offering simple bamboo huts close to the beach. At the top end is Sita Beach with a swimming pool and Castaway Resort with its 2 story breezy bungalows which was described by the Lonely Planet as ‘the most chic on Lipe’. * If you are travelling from Hat Yai, be in Pak Bara before 11 am to catch the speed boat. * If you are travelling from Langkawi the boat journey is shorter and there is a small efficient immigration on Koh Lipe. * There are no ATM’s on the island so make sure you bring enough cash for your stay, and then double it as you’ll end up deciding to stay longer! * Varin 2 on Sunrise beach has the newest and cheapest bamboo bungalow huts. * Castaway resorts has the cheapest accommodation. 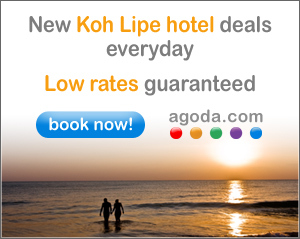 But we recommend to explore other resorts on Koh Lipe. Beaches on Koh Lipe are typically Thai, and famously fine. With four stunning stretches to choose from, paradise comes as standard. Stretched across Koh Lipe's luscious north coast, Karma Beach is an extraordinary place, often overlooked by the main island crowds. With uninhibited views of majestic neighbour, Koh Adang, some of the island's best snorkelling and the opportunity to slip into the water with a traditional longtail boat, this is one island secret you mightn't want to share. As the name suggests, Sunrise Beach on Koh Lipe is where the optimists hang out. This east coast hotspot is a stones throw from the small indigenous Chao Ley village, offering culture vultures a direct line to local life on the island. Sunrise Beach was a traditional stronghold for budget backpackers, but recent times have seen a steady rise in upmarket resorts. These days, the trump card for Sunrise is hidden offshore beneath the crystal clear waters of the Andaman Sea, where you'll enjoy easy access to some of the island's awe-inspiring coral reefs. Koh Lipe's most popular beach is a showpiece for idyll; with long stretches of soft white sand sweeping around the island's southern coast, and elegantly finished with the diamond waters of the Andaman. A quaint line-up of longtail boats bobbing offshore is backed up by a leading cast of upmarket accommodation. Meanwhile some of the island's best nightlife will ensure a dreamy combination of carefree and castaway. Pattaya Beach is the place to be seen during high season, and the crowds can reflect that. If you're craving some space to breath in the warm evening air, the other beaches are within easy walking distance. The quintessential cheap retreat, Sunset Beach is revered by the backpacking crowds for its allegiance to budget accommodation on Koh Lipe. The area lives up to its name, with some of the best vantage points to observe those famous Thai sunsets. Meanwhile, you should expect a heavy course of chillaxing to be served between meals in any of the great eateries in the area. As with all four of Koh Lipe's main beaches, you're just a short walk from Walking Street or a change of scenery, but if budget-chic is your thing, we doubt you'll stray far from this west coast Mecca. The isle of Koh Lipe is easily accessible throughout the year, but a little forward planning will ensure you use the island's high and low seasons to your advantage. Low season on Koh Lipe is known as the 'Green Season' by locals, and it doesn't take an expert to predict the reason for this annual lull in visitors. While the rainy season rumbles through the region, transport although available, is limited. Once you're there, you should expect to save up to 60% on accommodation. Throw in the incentive of snagging large swathes of beach to yourself, and a more personable (read: generous) service from the local bar staff and you've got yourself a budget-friendly compromise. Unsurprisingly, high season on Koh Lipe is one of the easiest times to visit, with multiple ferries shipping in travellers from a dozen ports within the Andaman Sea. While the island is in full flow, you can expect the full gamut of island life to be blooming brightly. If you're planning to visit during this time ‚ especially during any of the Thai national holidays ‚ then you should make a point of making a reservation in advance, as humble Koh Lipe inhales hundreds of world travellers. Arriving in Koh Lipe without a reservation during the peak season is not for the faint-hearted. You should bank on every room being booked out, on every night, as domestic and international tourists converge on the isle for extended holidays. Santa Claus might not be slipping down the local's chimneys, but that doesn't stop the whole of Thailand taking a tinsel break. Throw New Year into the pot, warm it up with some of the finest weather in the region, and you've got a recipe for an unforgettable festive season.